And YET the majority of them ruled AGAINST Lula & the fellow-crooks! This is exactly what happens when a loot is NOT divided amongst the fellow crooks! 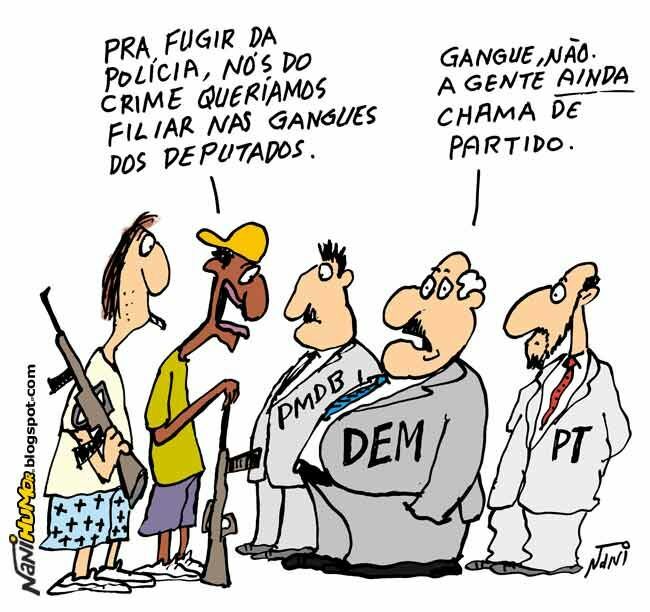 It did happen in the past [Maluf, Collor?] and with the others [Cunha, Cabral?]. They should at least have some [not crooked] ethics & unite to remain Not Guilty; to forever in Power! Apparently, the story attempts to legitimate the Supreme Tribunal decision to send Lula to prison by implying that if judges appointed by Dilma and Lula voted to incarcerate Lula, then there must've been compelling evidence supporting the decision. Of course, this fact could also show the possibility that Lula and Dilma's choice of judges was based on merit instead of blind allegiance. Additionally, on April 12 tribunal member Gilmar Mendes, with support of fellow member Ricardo Lewandowski, accused judge Sergio Moro of using detention instead of available alternative measures. On that day, Mendes voted to accept a habeas corpus seeking to free former economy minister of Lula government Antonio Palocci. A majority of court members voted to reject the habeas corpus. Palocci has received only a first-level conviction, but Moro pushed for his detention arguing that he may jeopardize the investigation. Mendes, who was main lawyer of the government of Fernando Henrique Cardoso and is anti-PT, compared the rejection of the habeas corpus with a martial decree issued during Brazil's dictatorship. I thought it was interesting, too. It seems to me that either Lula and Dilma choose good, honest judges, who made an honest decision about Lula's case, or else they chose corrupt judges who later turned on them to support the establishment. I suppose they could just have been unlucky, but 4/4 in Dilma's case seems well beyond chance. Enrique Lula Massot's analysis of the SC judges appointed by Lula and Dilma, is interesting but innacurate. With few exceptions, the presidents who appointed the judges expected a certain amount of 'gratitude' in return......so much so, when Joaquim Barbosa (now retired due to death threats to him and his family - just like Edson Fachin is going through now) did not let Lula off the hook in the mensalão as quickly as Lula would have liked, Lula publicly criticized him, calling him ungrateful...Wonder why ? Toffoli was affiliated to the PT, and was the Party's lawyer....elevated to the STF by Dilma who presumed his loyalty would be unwavering. It has been. Lewandowski was also affiliated to the PT, and showed his loyalty by not condemning Dilma to lose her political rights when impeached. Gilmar Mendes is no anti-anything...he's all for himself, going with the flow, trying to appear more than all the others, and probably attends the highest bidder. Many of his decisions, contradicting previous public positions on certain issues, are really quite inexplicable. Marco A. Mello may not be a declared petista but he seems to be favouring them of late. Alexandre de Morais, appointed by Temer - who thought it was a 'smart' move - is not being particularly loyal to Temer....as to being appointed based on merit, some were, but Toffoli definitely wasn't, as even as a lawyer he was quite insignificant, but he fit the requirements to not double-cross the PT. It's funny how the 'petistas' (and Reekie Lula Massot) all start from the premise that the judges are always wrong, and then look for reasons to justify their allegations...or, if someone is convicted, it must be because they are innocent....unless of course, they don't profess the same ideology. Despite the STF judges who, as a majority did not concede Lula's HC, there was the lower court judge, the three appellate court judges and five from the STJ, who all found Lula guilty. HONEST decision? in politics? By the Politicians? Is ANYTHING really honest in POLITICS? Thinking some more, the judges have to be approved by the senate like in the US, don't they? So none of the presidents could just appoint whoever they liked. Probably Dilma had to make more compromises than Lula so did try to appoint judges based on merit. It appears that EM approves or not of the judges based on how they voted on Lula. If he believes the judges who voted against Lula did so based on other considerations (bribes, party loyalty), it's equally likely the ones who voted for Lula did the same, but from the other side. How has de Morais been disloyal to Temer? I didn't think any of the accusations against Temer had gone anywhere since congress refuses to lift his immunity. Oh oh. In spite of being thrown in jail, former Brazil president Lula da Silva is still the favourite of the electors. Lula has a comfortable lead with 31 per cent of intention vote, while ultra right candidate Jair Bolsonaro trails behind with 15 per cent. In third position is Marina Silva of the Green Party with 10 per cent vote intention. Without Lula, blank votes would win the election, with 23 per cent of Brazilians casting a protest ballot. Looks like Brazilians are not assuming that somebody is guilty if imprisoned. A good thing that Lula is being moved to Brasilia, then. At this point it seems perfectly appropriate that Brazil has a president who is a convicted criminal and gets day release from prison to run the country. There are other ways of voting than at the ballot box. You voted with your feet by moving to Canada, a country that supports free trade and neoliberal policies, and recently backed the US strikes in Syria. I'm curious; when you left Argentina, did you ever consider moving to Cuba? Would you move to Venezuela now, so you can support the 'fight against imperialism' in person?